Current agricultural export policy uses Loan Deficiency Payments (LDPs) to supplement U.S. crop farmers’ incomes while allowing commodity prices to adjust to world levels. The assertion behind this strategy was that past U.S. agricultural policies that held U.S. prices above world levels had the effect of reducing U.S. exports into the world market. Now that LDPs allow U.S. prices to fall below loan levels, have the resulting prices enabled U.S. exporters to be more competitive? Have our competitors been forced to forego sales thereby increasing their carryover stocks or have they been able to export all of their surplus production anyway? In two recent columns we analyzed this question looking at our two largest soybean competitors, Argentina and Brazil. We calculated the level of production available for export as the difference between production (plus imports) and domestic demand. We then graphed the result against exports. What we found showed that they exported ALL of their surplus production in the year it was produced. Over the last thirty years, except for a blip or two, the level of carryover stocks for both countries was very steady remaining at near pipeline levels in most years. This pattern continued through years of high prices and low prices, favorable exchange rates and unfavorable exchange rates, high production and low production. What then about the United States? What does the chart look like when we make the same calculations? Looking at Figure 1 it is readily apparent that the pattern is quite different for the U.S. than it was for Argentina and Brazil. The bars representing production in excess of domestic demand and the line representing total exports do not match up very many times over the last thirty years. Likewise looking at ending stocks one can see that the level varies greatly from year to year. In a market like crop commodities where production cannot be tightly controlled or quickly adjusted there is a need for sufficient ending stock levels to provide a steady supply and someone has to hold those stocks. In the case of soybeans and corn it is readily apparent that the United States is the residual supplier and holder of surplus stocks. The other thing to note is that ending stocks represent a much greater proportion of export sales than with the Argentines and Brazilians. The ending stocks are almost always significantly above pipeline levels. Figure 1. 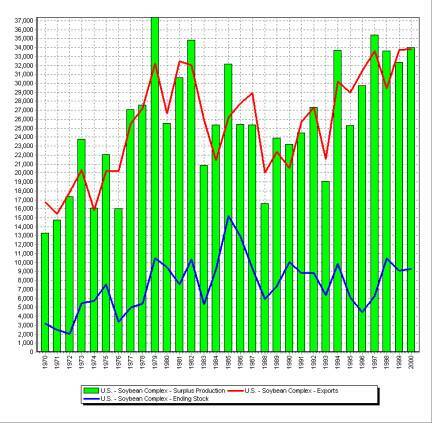 A comparison of U.S. surplus soybean production and soybean exports. Also included is the carryover level. It is readily apparent that U.S. surplus production and export levels do not track closely. Note the relatively high levels of carryover stocks and the year to year variability in carryover levels. (thousand metric tons) Data source: USDA PS&D. Looking at this pattern we have long theorized that no matter what the price the U.S. is willing to accept for its soybeans, our competitors have been willing to go a nickel lower to capture the sale. This is typical behavior that is seen when an upstart firm has to compete with a dominant player in a market. Whether the price is high or low the seller in the greatest need of cash (usually the less dominant player) drops the price to get the sale. When they have sold all they have to sell the dominant player, who is also the residual supplier, sops up the rest of the sales. If that in fact is the behavior of our competitors, it illustrates a fundamental weakness in the argument used to justify using LDPs so that commodity prices could fall to world levels. If our competitors are going to discount their sales by $10 to $20 per ton to get the sale, it matters little whether the price is at a moderate loan rate level or below the U.S. variable cost of production. All the use of LDPs does is increase the cost to the U.S. taxpayer while providing commodities to the world at record low prices. The gains in exports for these commodities will be relatively small at best. If as the dominant player in the market and the holder of much of the world’s surplus soybean crop, the United States decided to adopt the same marketing strategy as Argentina and Brazil, there could be a limbo dance with the caller crying out, “How looooow can you go?” The resulting dance contest would be disastrous for agriculture in the United States, Argentina, Brazil, and the rest of the world as well. Only if the dominant player has deep pockets and can permanently bankrupt all competitors, will such a strategy work. In the United States this type of predatory pricing practice is considered monopolistic and is illegal. Again if our competitors are using price as the tool to move their crops onto the world market, then the U.S. needs to rethink its export enhancement strategy. Allowing prices to fall to world levels will not gain additional customers and as has been apparent they will not deter our competitors from increasing their acreage and yields. The major effect of allowing prices to fall to world levels is to reduce U.S. export income and increase the costs to U.S. taxpayers. I am sure this is not what the proponents of current policy intended to happen. It should be noted that LDPs were initially used for crops (cotton and rice) is which the U.S. is a minor player in the market. For those crops LDPs were successful in moving our surplus production out into the world market and a low price strategy worked. The amounts we had to move were just blips in the world markets. With corn and beans the amount of surplus we produce is to large to be absorbed by world markets.